At Jamf, we have a dedicated team of service professionals ready to help you optimize your Jamf Pro investment. We understand that your organization is unique, and it's our goal to help ensure your Apple initiative is a success. 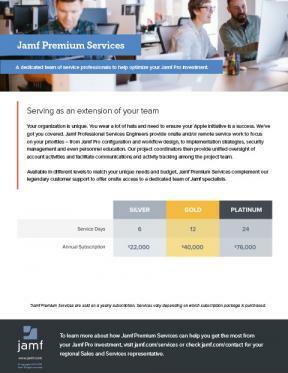 Available in different levels to match your unique needs and budget, Jamf Premium Services complement our legendary customer support to offer onsite access to a dedicated team of Jamf specialists.